Both natives of Natchez, the clinical associate professors of pharmacy practice didn’t know each other until meeting in between classes in Faser Hall as student pharmacists at the School of Pharmacy. While Kristen was waiting to meet with John Bentley, now chair and professor of the pharmacy administration department, Adam walked up and said, “Hey, that’s my mom on that composite picture. Aren’t you from Natchez?” Fate stepped in again when Kristen worked with Adam’s mom, also a pharmacist, during her first introductory pharmacy rotation. 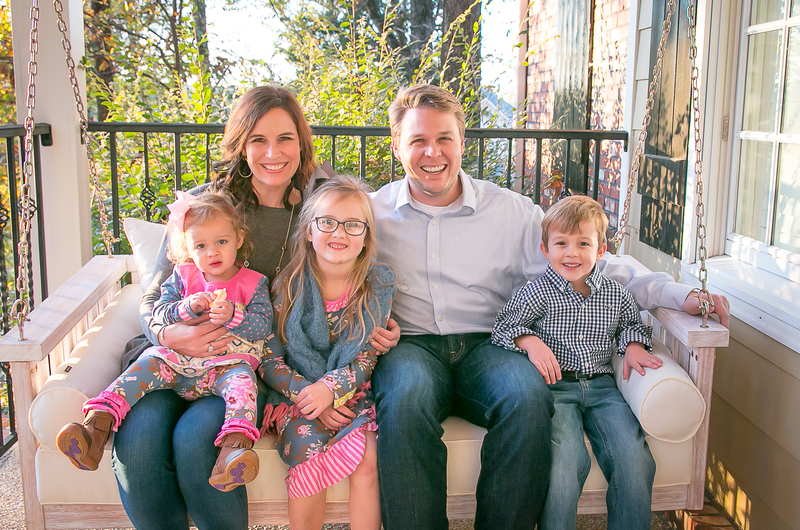 Kristen and Adam Pate with their children, Ivy (left), Aubrey and Eli. “She always said she started praying for me then,” Kristen said. Adam said it took a couple of years to convince Kristen to go on a date with him, but they became official during the summer before their third year of pharmacy school. After moving all day from Oxford to Jackson, Adam made dinner and brought it to her house for their first date. On the menu was chicken pasta and, for dessert, banana caramel pie. Nearly one year later, Adam was ready to propose. He set up a date for them at a dance class in Jackson and planned to propose at the end of class. Kristen had no idea, which was clear when Adam had to convince her to not rush out at the end. 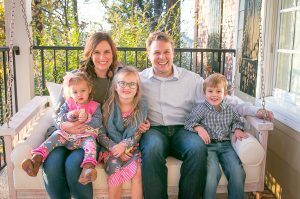 After almost nine years of marriage, the pair enjoy cooking together and planning fun activities for their kids, six-year-old Aubrey, four-year-old Eli and two-year-old Ivy. The most popular activity at the moment is family dance parties to Taylor Swift, the Trolls soundtrack or Maroon 5. With a full house to come home to, it’s no surprise Kristen and Adam don’t talk much about work after hours. Being able to separate the two is all they’ve ever known after working together as students, residents and faculty members. Although they work well together, maintaining a divide between work and home is something they feel helps foster a successful marriage. Their appreciation for each other continues to grow as they become more involved with their kids, who are always more than happy to enjoy a banana caramel pie with their parents.